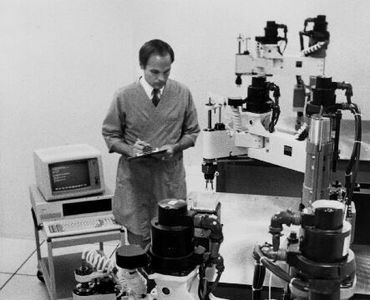 The IBM 7535 Manufacturing System was announced in 1982 to quickly and precisely perform a range of industrial tasks. Its jointed arm could move in four directions and could pick up, assemble and load parts such as those shown on the table in the foreground. The robotic system could be programmed with an IBM Personal Computer (on cart next to operator), using a special version of the IBM-developed robotics language, AML (A Manufacturing Language).